Enormous building needed to assemble giant space craft or space stations. In the novel, a very large building is constructed for the sole purpose of housing the Space Platform, a space station built on Earth and then rocketed into orbit by pushpots, independently manueverable engines. The Shed was a gigantic metal structure rising out of sheer flat desert. There were hills to the westward, but only arid plain to the east and south and north. There was but one town in hundreds of miles and that was Bootstrap, built to house the workmen who'd built the Platform and the still invisible, ferociously howling pushpots and now the small supply ships, the first of which was to make its first trip today. There were acres of wood-block flooring. There was a vast, steel-girdered arching roof which was fifty stories high in the center. All this size had been needed when the Space Platform was being built. Men on the far side were merely specks, and the rows of windows to admit light usually did no more than make a gray twilight inside. But there was light enough today. To the east the Shed's wall was split from top to bottom. A colossal triangular gore had been loosened and thrust out and rolled aside, and a doorway a hundred and fifty feet wide let in the sunshine. Through it, Joe could see the fiery red ball which was the sun just leaving the horizon. The Shed seems to me to be a remarkable prediction of the Vehicle Assembly Building (VAB). In 1961, NASA approached the U.S. Army Corps of Engineers with a problem. They needed an interior space in which to put together the largest rocket of its time - the 363 foot tall Saturn V launch vehicle. The Corps responded magnificently. 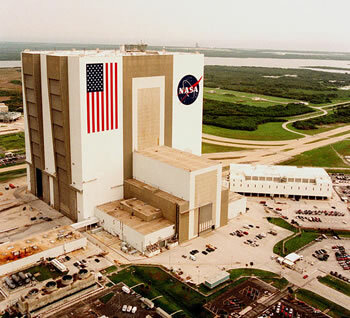 Construction of the VAB began in 1962, with 4,200 steel piles driven to bedrock 160 feet below the surface. Four years (and 58,000 tons of steel) later, the $100 million dollar building was complete. I've been to Cape Canaveral (now the John F. Kennedy Space Center), and I can tell you that it is quite a sight. Note that the stars on the flag painted on the building are six feet in diameter; the stripes are wide enough to drive a tourbus on. It encloses more than 128 million cubic feet of space - the largest building in the world when built (in terms of volume enclosed). "The VAB is not so much a building to house a moon vehicle as a machine to build a moon craft. The Launch Control Center that monitors and tests every component that goes into an Apollo vehicle is not so much a building as an almost-living brain. "